Blockchain technology has been revolutionizing multiple facets of businesses including payments, utilities, digital identities, supply chain, etc. Out of most of the use cases, developed on the blockchain, Supply chain is considered as the most complex in implementation. In an interview, Ms. Hope Liu, the founder of Eximchain, is explaining the business model of Eximchain and the challenges involved in integrating the blockchain for the supply chain industry. Hope: Here is a brief background about myself – I am born in Tianjin, China. I have a B.A from Peking University and an MBA from MIT. Previously, I have had the opportunity to handle cross-border transactions at UBS Asia for over 6 years and I was the Lab Lead of the North American Blockchain Association. I became very interested in blockchain applications when I started learning about blockchain in an MIT Media Lab course. At the same time, I came from a background in cross-border transactions and banking. This was the turning point as I saw a window of opportunity to integrate blockchain technology as a way to improve supply chain processes. My co-founder and I recognized the opportunity inherent in blockchain and thus decided to start on the Eximchain project. We are motivated to become the blockchain infrastructure for supply chain applications. 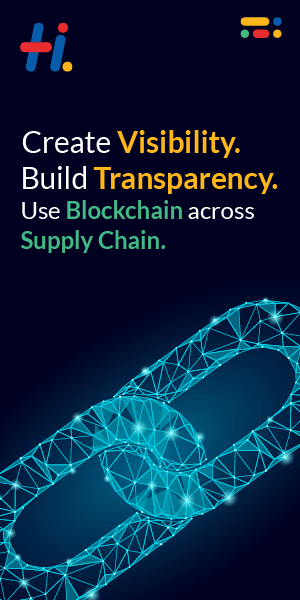 We aim to fill in the gap for over $5.2 trillion lost in potential revenue each year, due to the lack of transparency, connectivity, and agility in the global supply chain industry. BM: What motivates you the most in the blockchain industry? Hope: The blockchain industry is extremely dynamic and fast-paced. However, the main motivation that keeps me going every day is the chance to overcome challenges. It is my ambition to be a part of the force to transform the business industry, like supply chain, through the use of blockchain. By amplifying and tapping on the positive impacts of the blockchain, we could transform various business models and streamline operations. Apart from empowering businesses and educating the community on blockchain technology, this whole experience gives me a sense of satisfaction as we could create an impact on the environment that we are living in, turning challenges into opportunities by staying at the forefront of technological innovation. BM: What suggestions would you give to the budding entrepreneurs in blockchain? Hope: Embarking on an entrepreneurial journey will definitely be tough and running a business is never easy. I am heartened to see more and more young entrepreneurs carving out a career path for themselves in the blockchain industry. I would highly encourage all the young entrepreneurs out there to never fear to take the risks to explore and constantly adapt to new changes. It is also important to adopt a flexible mindset to keep up with the ever-changing technological trends. By staying at the forefront of innovation, this would allow you to constantly discover ways to turn challenges into opportunities, allow businesses to integrate blockchain technology as a way to simplify and streamline their operations. BM: What is the core idea behind Eximchain? Hope: The core idea behind Eximchain is to provide blockchain-based solutions to transform the global supply chain by reducing barriers, increasing coordination, and instilling trust in cross-border transactions. In the long term, Eximchain-powered supply chain solutions help businesses connect, transact and share information more efficiently and securely. Using Eximchain’s public blockchain network, enterprises can eliminate traditional supply chain barriers and integrate actors big and small into an efficient, transparent and secure global network. Eximchain uses blockchain technology to digitize and decentralize business processes that have traditionally relied on intermediaries such as brokers and banks. Blockchain enables Eximchain’s applications to create decentralized ledgers, reduce transaction costs, and securely share information and value in real time. BM: How does it start? What is your supporters and critics’ stance on Eximchain? Hope: I have always found that there were huge inefficiencies in handling cross-border transactions. There were always so many manual processes involved and it did not make sense to me. In 2015, I decided to quit my job. I was determined to make a change in the global settlement industry. I was accepted into the Massachusetts Institute of Technology – Sloan School of Management as an MBA candidate and I was looking for a technology that could change the paradigm. At the point in time, I was in a Media Lab class when the idea of blockchain was mentioned. It was then that it dawned upon me that blockchain is the key answer to all the global payments issues. That was the turning point when I began working on the Eximchain project together with my partner, Juan Sebastian Huertas, the current CTO and Co-Founder of Eximchain. Together with the team, we decided to use blockchain technology to tackle the global payment problem in the supply chain industry by creating a public blockchain network that helps enterprises to connect, transact and share information seamlessly. We faced a lot of challenges when starting Eximchain at the very beginning. My idea did not take off. Despite winning the Legatum Seed Grant and getting into the Plug and Play Accelerator, I faced difficulties in persuading supply chain users to integrate blockchain solution. The early stage investors and people from the supply chain industry were skeptical about the idea. When I was struggling to get my idea across, Juan Huertas came into the picture. Sharing the same passion in the blockchain, our team made it to the final of the MIT 100K competition in the Year 2017 and continued working our idea with funding support from the MIT Sandbox Program. We have managed to expand the team from 2 people to 12 across 3 countries and have raised $21M funding in total. BM: What are the important bottlenecks in the supply chain which blockchain can solve? Hope: In a supply chain, there are two things that are of utmost importance. The first is getting high-quality goods delivered on time, and the second is being paid on time for the goods delivered. For companies that have been dealing with one another for a long time, they can trust that payment and product delivery will always be on time based on experience. Such trust takes many years to build up, but trust and reputation are only known between a buyer and a seller. For a global supply chain with thousands of small and medium-sized enterprises (SMEs), this limits the business they can do with one another. To gain the trust of each new partner, every one of them must repeat a process that is costly and inefficient. The blockchain is a natural answer to the issue. With an open, transparent and secure ledger, it enables all parties of the supply chain to have visibility of the transactions, which includes the delivery and payment of goods. Most importantly, a blockchain’s decentralized nature means the data is difficult to falsify, thus reducing fraud. The recorded transactions form the basis of trust for everyone on the supply chain. As more buyers and sellers transact on this blockchain over time, the data collected brings valuable insights to those connected in the network. Suppliers that deliver goods on time can be counted on in the future to do so again, solidifying their reputation and reliability with each trade exchange. The same goes for buyers that pay on time – they establish themselves as the companies that others would want to trade with. Through the use of blockchain, it shows a company’s standing for the industry to move forward. From the perspective of an SME, it signifies opportunities to work with partners that they would not have worked with previously and securing a trusted relationship that would take years to build. BM: What are the challenges in implementing blockchain technology in the supply chain? Like VAT, Tax, etc. Hope: For a company with the massive number of invoices, it will not be easy to bring them onto blockchain within a short period of time. Some business enterprises may face inertia to implement blockchain technology unless the invoices bring value to future transactions instead of simply being references or records to be stored away. In addition, for more businesses to embrace blockchain technology, tools are required to allow simple porting over of data. However, this could be as a short-term problem as tools are in the midst of development. When it comes to taxation, blockchain could provide tax authorities perfect transparency on taxable supplies, which could easily be monitored in real-time to calculate tax liabilities and spot attempted frauds. But if governments are not agreeable on shared data requirements and formats, that could be a problem. BM: What is your vision for blockchain in specific and Eximchain in general? Hope: Today, blockchain faces challenges to in terms of providing the accessibility for more users. It requires more Software Development Kits and an active ecosystem to create both consumption and development of decentralized apps. However, blockchain is currently going through a stage of transformation. I would envision that blockchain would be integrated as a part of operations for many businesses, especially for future transactions. For companies with a long supply chain, returning goods to the original vendor might not be as smooth as it seems. Manual reporting will inevitably cause inaccurate data points and it would be time-consuming as well. Eximchain wants to help enterprises/ supply chain businesses better track their goods back to the original purchase order and quickly collect downstream data. For participants in the e-commerce ecosystem – manufacturers, suppliers, buyers and 3PL, each party would need to reconcile and manage their inventory data records via endless interface maintenances across different business systems. Eximchain is looking at building solution on blockchain that creates a common ledger and gives each party real time update about the upstream demand. This would help to optimize a safer inventory level to avoid waste and backlog. In the future, Eximchain will have to constantly explore different possibilities and ways to help enterprises/supply chain businesses to overcome inefficiencies and challenges through the use of blockchain. BM: Is there any impact of a change in regulation to Eximchain? Hope: Bill lading is one of the key documents in trading processes that records the collaboration of shippers, customs of importing and exporting. The current process takes a long time and large costs of processing, sending, receiving and endorsing. The cost of replacement is even higher in the case of lost. On solutions built on blockchain solutions, all parties are able to receive the update on the change of ownership/status in real time. BM: Is there any message you want to share for the blockchain community? Hope: The world is moving in the direction of simplifying and streamlining the movements of e-commerce goods, as well as transaction processes. Blockchain has the power to change the way things are done and companies/enterprises will have to brace themselves for a greater innovation and transformation in business models that are coming their way.